The Dinosaurs Unearthed exhibit at Kansas City’s Union Station was a treat for my family. From my nephews who, at 7 and 8, think dinosaurs are the coolest things to ever walk the Earth to my daughters who, at 3 and 5, see dinosaurs as friendly creatures on Dinosaur Train, to my husband and brother-in-law (geeks to the core), the exhibit was fun, informative and educational. 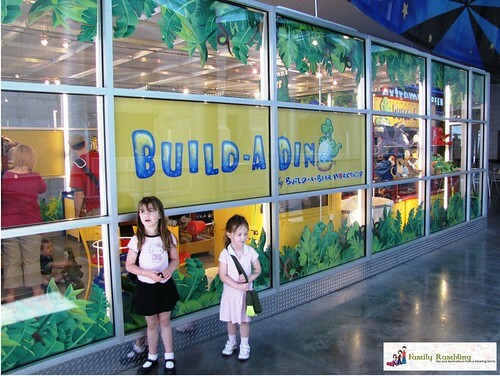 Before entering the actual exhibit you see items from Science City’s Dino Lab- plaster moldings, bones and information about how the lab prepares dinosaur fossils for exhibition. 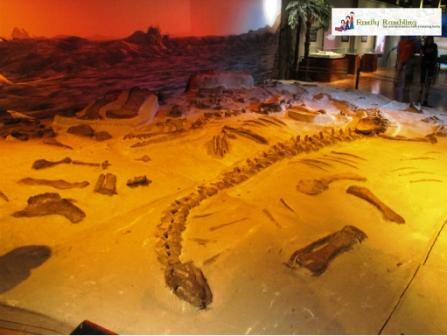 As you enter the exhibit you encounter a “dinosaur dig”. 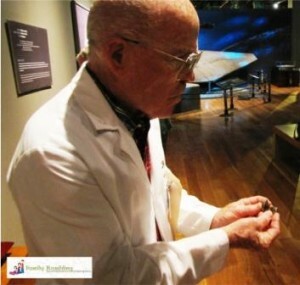 As you learn about the bones on display you will read about their discovery- who, when and where. Trying to imagine finding something like this is beyond my imagination! 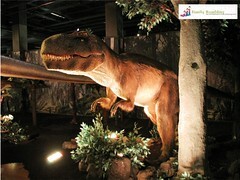 Twenty-four of the dinosaurs are full size and animatronic, which can be a little overwhelming for smaller children. Caelan wasn’t impressed by the triceratops that turned it’s head and looked at her. She was much less intimidated by the ones she could control with the push of a button. We all learned something from the paleontologist standing near the triceratops who showed us triceratops teeth- and explained how a new tooth would replace the old but, unlike humans, the cycle didn’t end- and let us touch a real pointed plate from the back of one. 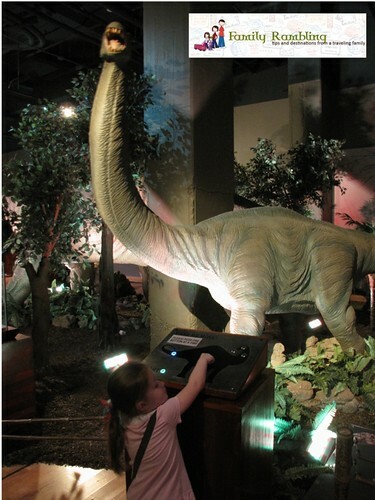 Other very cool things to see and touch in included dinosaur eggs and dino poop. An interactive display showed the head of a T-Rex and explained that a sneeze from the great beast would release up to seven gallons of snot. The kids loved that tidbit! It was also very interesting to see a “living dinosaur”- the chicken- and see why it is referred to as such. 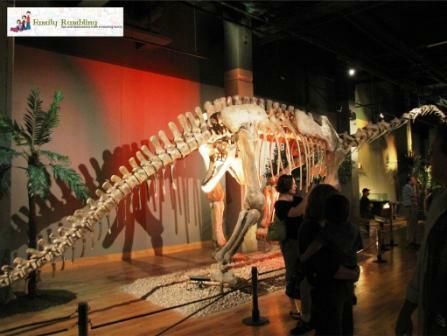 Skeletons were positioned throughout the exhibit, as were fossils. Some were huge (like the leg of a mastadon that was more than twice my husband’s height) and many were so tiny I wondered how they weren’t overlooked. But what I found most interesting was the difference in what I learned about dinosaurs when I was in grade school and what scientists believe now. For example: it is now believed that a baby T-Rex had a coat of fur that he lost as he matured. Or that many of the raptor species (like the velociraptor, shown below as previous thought and current thought) actually had feathers. The exhibit was interesting and informative. We spent just over an hour in it; if you have a mini paleontologist with you it could easily take an hour and a half to two hours. A gift shop is at the end of the exhibit and has all kinds of dino goodies (including a Dino Poop book that comes with a chunk of poo) and Dinopoly. If your kids are like mine, though, they will want to head back upstairs to the Build-A-Dino® by Build-A-Bear Workshop®, temporarily located in Union Station just for the exhibit. The temporary shop is located on the lower level near the Extreme Screen; you can’t miss it as you take the escalator down to the exhibit. Just like Build-A-Bear Workshop® you choose your dino (choices include a velociraptor, T-Rex, brachiosaurus, triceratops, and a wooly mammoth, among others), include a roar (extra charge), stuff it, add a heart and pick out accessories (clothing with a dino theme, dino dish set, a dino backpack so you can tote your new friend around on your back, shoes, bags, shades…) and create your birth certificate (which now has a code on it to register your new friend at Buildabearville.com for more online fun. The girls with "Hearts" and "Diney"
We brought home Diney and Hearts. The girls used the money they had been saving and were quite proud to purchase their new friends themselves. 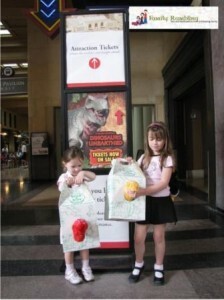 Disclosure: Union Station provided tickets for my family to view this exhibit. All thoughts and photos are my own. Looks like everyone had fun! What a great exhibit.